After eight years or so in development, The Last Guardian was always going to be either a masterpiece or a disaster. At least, that’s how it seemed; the truth is halfway between. You’re probably aware that this is the end to an unofficial Fumito Ueda trilogy. Ico, Shadow of the Colossus, and now The Last Guardian are tenuously linked, if only aesthetically and thematically. Although the game takes place in a huge ruined castle, suspiciously similar in appearance to that of Ico, it is (ostensibly) neither a prequel nor a sequel. You, as an unnamed young boy, start the game by waking up in a cave next to a large wounded beast. The beast is chained, and appears to be wearing some sort of damaged battle armour. You’re covered in mysterious tattoos. You don’t know what the hell’s going on. The Last Guardian steps closer to traditional storytelling than either of the other games. Scattered throughout the experience is narration provided by the boy, now a man and recounting his experiences with the beast in the castle. These snatches of commentary are, however brief, few and far between. It’s still very much a case of “environmental storytelling” (basically, you have to pay close attention to cutscenes and your surroundings to piece together the story by yourself). Using this narration to give the player a nudge if they seem to be spending too long finding a way forward is a neat touch though. Calling this a puzzle-platformer is a bit of a stretch. There’s not really anything easily identifiable as a puzzle; if the way forward isn’t immediately obvious, all you need is to explore and possibly experiment. Though you’ll be separated briefly from time to time, you spend more or less the entire game with Trico (the beast’s species, rather than its name). 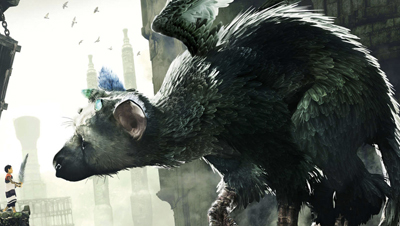 Trico him/her/itself is a flawed masterpiece. When you get close, it’s aesthetically a bit of a mess, and (like pretty much the rest of the game) clearly a PS3 creation wearing a PS4 moustache. The head is wonderfully rendered and fairly expressive, but the feathers on the main body look rather unrealistic, however that’s not very important. It’s interesting and impressive how Trico’s personality, and in turn the relationship between it and the boy, evolves over the course of the game. To begin with, it’s little more than a sort of pet that you take advantage of, using the head as a platform or gripping onto the feathers as it happens to cross a gap you could never tackle yourself. By the end Trico, while still animalistic, is more like a friend. A stupid friend thanks to the AI, but still. You’ll have helped and saved one another multiple times, with Trico often stepping in to aid you of its own volition. Intended as an emotional journey where play does (nearly) all the talking, this noble aim is scuppered by some schoolboy errors that Sony had more than enough time to ensure were squashed. The art design is typical of a Ueda project, and therefore wonderfully atmospheric. It is unfortunately accompanied by a camera that, especially in the second half or so of the game, insists on straying much too close and obscuring the boy you’re trying to control. The result is sometimes the camera making a determined attempt to disappear up Trico’s arse as though you’re trying to conduct an endoscopy. Other times, you might be able to see what’s going on fine, but a bit of scenery that looks grabbable actually isn’t and/or you miss your jump for no particular reason, sending you to back to the last checkpoint which, incidentally, is sometimes a little too far back to keep the flow of the experience going. The guards that will try to grab you throughout the game are rather pointless. All you have to do to free yourself is inelegantly bash all the buttons on your controller, which is stupid. You’ll never get dragged into one of the mysterious blue doors unless you will it; and similarly, you won’t be completely enamoured with The Last Guardian unless you convince yourself you should be. Could’ve done with another four years development time. CeX Browns Plains is OPEN! £5000 Gadget Haul NEW WINNER ANNOUNCED!